You may notice the headline here is that you can easily create bootable install media for old and new PCs, but they're not all alike. That's right. For older stuff, it's NTFS on an MBR. For newer stuff, like the SP3 (Surface Pro 3), it's FAT32 on GPT, a requirement Microsoft documents here. Huh? 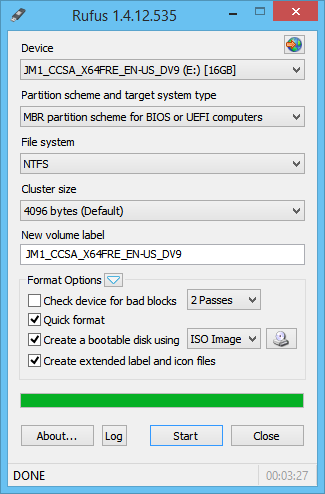 It just means this: if you intend to do fresh/clean installs (not upgrades) on both older and newer PCs, you may need to create 2 separate bootable installer USB flash drives. No biggie. Note: the OS still goes to your SSD or HDD. Once the ISO file is downloaded, the whole process of following these instructions will likely take you well under 10 minutes. In other words, it's simpler to do than it sounds. These instructions also likely apply to Windows Server 10 as well, and are intended for an intermediate audience that is comfortable with testing operating systems, and know that protecting and backing up your data is your responsibility. If you have issues with trying to boot from media you created with the venerable Microsoft Windows 7 USB/DVD Download Tool, such as a Surface Pro 3, then this article's alternative approach might be for you. A single free tool that can make bootable Windows install media for any PC. Download Rufus from here, if you'd like to create bootable installation media. The portable version is fine. if prompted to download a file called menu.c32, say "Yes"
Ideally, use a (often blue colored) USB 3.0 port. Your PC will have any number of ways to alter it's boot sequence for this boot only, I cannot possibly document or support the list of issues that might plague you during this piece, but if it just won't seem to boot from the flash drive you just created, consider trying a USB 2.0 port and/or flash drive install, which tends to be a little easier to get going. When asked about disk drives, it's easiest to delete all existing partitions (assuming you don't care about any data you have on there! ), then let the installer handle the rest. Please drop a comment below, if you spot an issue with these install instructions, and especially if you found a way to create boot media that works on both legacy and UEFI systems. Enjoy! Windows can't be installed because this PC uses a compressed operating system.